The FOX 801 Heat Flow Meter is an accurate, easy-to-use instrument for measuring thermal conductivity according to ASTM C518 and ISO 8301. Capable to operate both in standalone or PC-controlled configurations, FOX 801 Heat Flow Meter provides rapid and accurate results. 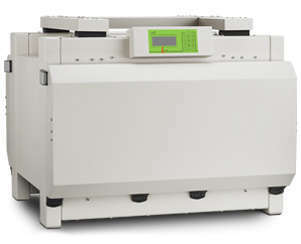 The instrument features proprietary thin film heat flux transducers, digital thickness measurements and responsive temperature control. A versatile instrument, it is especially well-suited to measuring slices of cellular plastics. At the heart of the measurement is the LaserComp Heat Flux Transducer, designed and manufactured specifically and exclusively for thermal conductivity measurements. The Heat Flux Transducer integrates over the entire active area (254x254mm / 10 sq. in.) to provide a truly representative measurement of the total heat flow. Overall transducer thickness is less than 1 mm, precluding heat flow distortion. A type E thermocouple is bonded in the center of each transducer and both are sealed to ensure consistent precision over the life of the instrument. Because each thermocouple is positioned within 0.1 mm of the sample surface, they provide truly representative readings of the sample’s surface temperature (± 0.01 °C resolution) and heat flux. The same thermocouples are also used for plate temperature control. 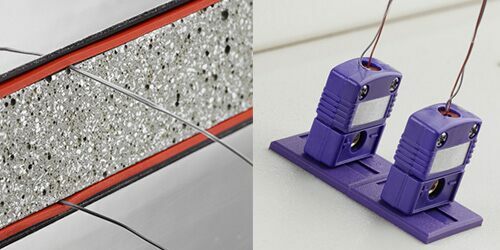 Thermocouples are attached directly to the sample surfaces, eliminating the impact of interface resistance, and improving the measurement accuracy for higher thermal conductivity samples (up to 2.5 W/m K). In case of rigid specimens the external thermocouples can be also placed in grooves machined in the sample. Instruments configured for this option feature auxiliary outlets for the external thermocouples. The FOX 801 Heat Flow Meter can be configured with the innovative Rotational System from LaserComp. Understanding the complex combination of heat transfer mechanism present in field installations, the Rotational System allows to measure thermal conductivity under conditions matching real-life material’s orientation. 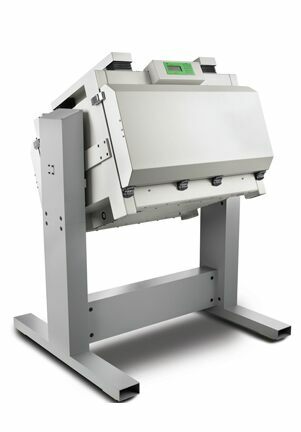 The rugged system allows the motorized rotation of the test system to a user-defined angle between 0° and 90°. This allows for the exact, representative, simulation of conditions present in roofs, walls, skylights, and more. The Multi-Transducer design provides users with measurements of thermal conductivity at different locations in their samples. The measurements from the multi-transducer also help to check how homogeneous their samples are. The Multi-Transducer is a 300mm (12”) squared area bonded to the center of each instruments plate. 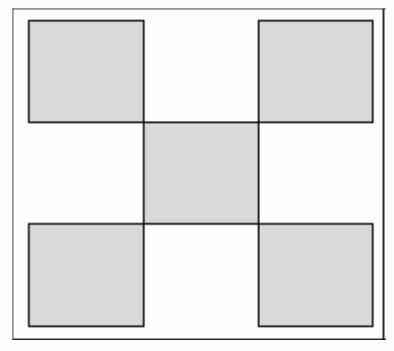 The five 100 mm (4”) squared measuring areas are arranged in an X pattern. The WinTherm software provides an easy graphical way to select which heat flux transducers are to be used during each test. Any number of heat flux transducers with their associated thermocouples can be selected. The WinTherm displays the total average thermal conductivity as well as each individual measurement for thermal conductivity in each location.